Offering separate classes for children and adults, we formally train in the Seven Star Praying Mantis system, a style of Northern Shaolin Kung Fu created by Master Wong Long in the 16th century. 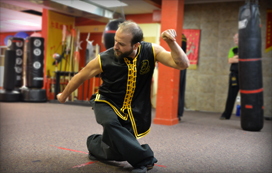 The style builds on the fighting skills Wong Long learned as a Shaolin monk, incorporating the fierce, lightening-fast predatory style of the praying mantis and the extremely efficient footwork of the monkey – both of which he observed while training. 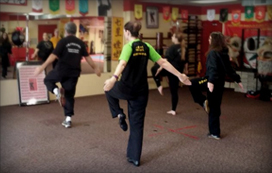 In addition to Traditional Kung Fu, we offer fitness classes based on martial arts with a focus on building strength, stamina and confidence for a full body and spirit workout. We currently offer classes for Tai Chi, Kickboxing, Core Conditioning, as well as Qigong – the perfect complement to physical excercise that helps to reduce stress, build stamina, increase vitality, and enhance the immune system. 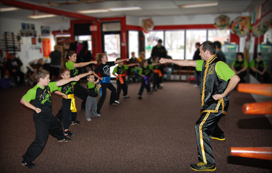 Our kids Kung Fu classes are for kids of all ages and abilities. We work them as a group and one on one to teach them all the techniques and forms of Shaolin Kung Fu. They learn respect and discipline and come away with strength and confidence.